As consultants and PEO brokers, The OIS Group specializes in evaluating options inside and outside of a PEO relationship. While these services have traditionally been sold in silos, we take a holistic approach to understand your needs, save time, and obtain cost effective results. We understand the complexity and overlap among these services and, through due diligence, are able to leverage expertise, provide global visibility, and streamline the decision making process. By definition, risks exist where you don’t expect them to be. Have an expert review your personal insurance needs. Navigate International Human Resources with Ease. You take care of your team so that they in turn can take care of your clients. The problem is, as your organization grows, that process becomes increasingly complex and costly. 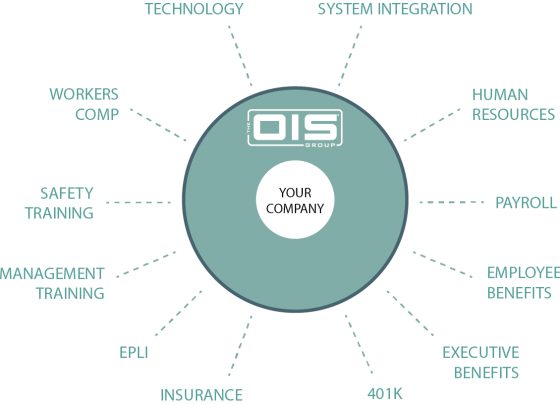 At The OIS Group, we work with you to find the best solutions for your specific needs. There is no one-size-fits-all answer, which is why we customize everything individually for our clients – saving you time and money so your team can focus on getting back to work taking care of your clients. Want to see what we can do for you? Set up a consultation today. conduct a full review free of charge? Is a PEO or ASO Right for You?